India isn’t probably the type of country you’d associate with an abundance of fast food restaurants, and to some extent that’s the case but along with everywhere else in the world, fast food is becoming part of the lifestyle in India. The big fast food chains have all made brave attempts to conquer the Indian market. McDonald's, Domino's and KFC all found it difficult to cater for Indian tastes, but then decided to change their own menu to adapt rather than expect a cultural shift – and now McDonald's and Domino's have a wide presence in India. KFC have struggled. The key to the success of the big chains is adapting the traditional Indian snacks and cuisine to make them fast food friendly. The street food in India is as diverse as the population, but there are some snacks that you’re likely to find all over the country. You really can’t visit India and not sample some of the native Chaat – a hugely variable spicy snack mix, often seasoned with lemon, pomegranate seeds, Kala Namak (black salt), tamarind, and various chutneys. Chaat can be anything from a fruit dish with guava, banana, apple or melon, crisp pancakes called paapri, served with yogurt, or sometimes potatoes sauteed with black cumin powder. 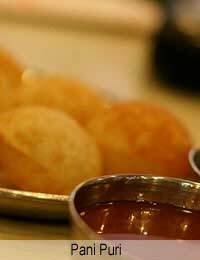 Also on the street carts as standard are Pani Puri – hollowed out crispy dough balls with various fillings, Aaloo Tikki - deep fried mashed potato and masala patties usually served with a curry called Chholey (chick peas). They are most popular in Northern India in the winter. If you’re on a train, you’ll often be offered a Chaap, a potato patty dipped in flour batter and deep fried, usually dished up with onion slices. For a quick sweet snack, try a Chai-faen which is simply a combination of tea with a roasted biscuit called "faen", or occasionally ‘khaaree biscuit’. Another tempting sweet treat is Vada pav – a great example of West Indian street food, eaten with Masala chai which is a delicately spiced tea. For anyone with a real sweet tooth though, the ideal snack is a jalebi or jangri, which is a syrup-covered deep-fried sweet available throughout India. What’s available on the streets to eat can understandably vary depending on where you are. For example in Calcutta you can find ample street food, and the wide selection includes phuchka, which is much loved in the city and thought to be the favourite snack. It consists of little dough balls filled with all sorts of goodies, like mashed potato and herbs, and dunked in tamarind water and cumin for flavour. Jhaal-mudi, another Calcutta specialty, consists of puffed rice spiced with lemon and coriander and sometimes also mixed with peanuts, chopped onions, and chilli. In Calcutta, common varieties of fritter are the beguni (aubergines fried in chickpea batter), phuluri (fried chickpea batter), and pakodas (assorted vegetables fried in chickpea batter). If you want to stop and pass the time while you eat, Calcutta is also known for its rice hotels, which serve rice-centric snack style meals. Moving on to Kerala, in South India, the fast food there is available from ‘thattukadas’ which are covered catering carts fully kitted out stoves and utensils. They usually offer ‘thattu dosa’ which are rice-flour crepes fried in coconut oil and served with coconut chutney. You’ll also find thattukadas serving up omelettes, spicy pork , and parottas (like naan breads, but beaten and mixed with oil). Chaat is most popular North-Indian snack, and it comes with so many variations. Chaat parties are also popular in India.It’s sometimes called Tikki Ki Chaat or Ragda Pattice. Mix the mashed potatoes, chilli, dried coriander, cumin and chopped coriander, one of the onions and salt into a smooth paste. Shape the mixture into equal-sized patties. Heat oil on a griddle and shallow fry the patties till crisp and golden. Drain on kitchen towels. Add 1 cup of water to the chickpeas along with the cloves, cardamom and peppercorns. Bring to the boil while stirring, turn off the heat. Take out the cloves and whole spices. To serve – put two hot patties onto a plate and spoon over some of the chickpea mixture over them. Add a chutney, and chopped raw onions if liked. Then sprinkle with garam masala.